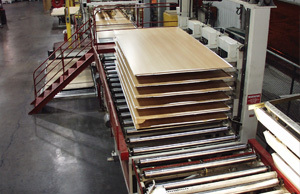 Accumulating/Dispensing Material Handling Machinery for Wood and Related Production Environments – Creative Automation, Inc.
We offer a broad range of custom accumulating and dispensing equipment to increase production line throughput and eliminate rejects. Accumulators provide queue/surge capacity in a small footprint so product from upstream processing machines always has a place to go, regardless of downstream conditions. 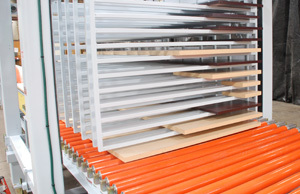 Automated buffers temporarily store product if downstream equipment is not ready for it. 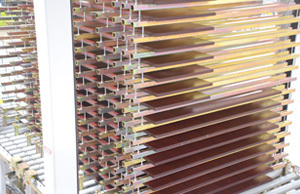 Product from upstream processing machines always has a place to go, therefore maximizing line throughput. 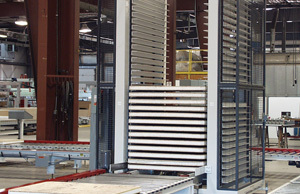 This 20-layer automated buffer can store one long panel or two shorter panels per level, for a maximum capacity of 40 panels. Empty levels collapse so no floor pit is required. 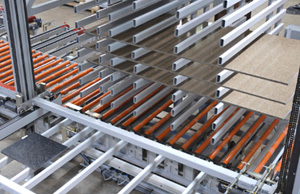 At the end of this production line, finished panels are collected on edge in a porcupine. Panels are easily removed by personnel who are kitting orders. Fully automatic, high capacity slipsheet accumulator/dispenser can collect from and dispense to multiple lines. Accumulator stores stone countertops and retrieves them when called for by the customer's server. 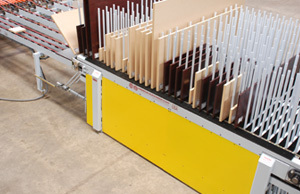 Automatic accumulator in this laminating line allows the laminator to empty when line disturbances occur downstream, helping eliminate rejects. 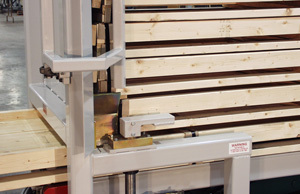 Closeup of a pallet dispenser feeding a pallet. 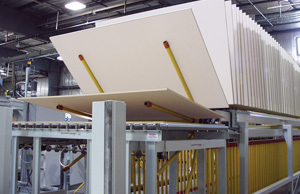 Panel cooling section after a hot press.